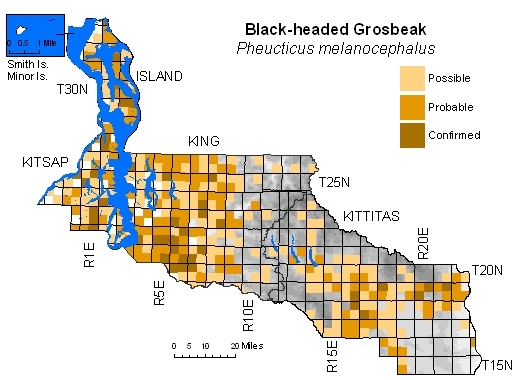 Common throughout at lower and middle elevations in hardwood or mixed forests and along riparian corridors, with a few records extending to Cascade passes. Avoids dense, moist forest at higher elevations, but common in riparian growth in lower, dry-forest zones of Kittitas County. Absent in extensive shrub-steppe landscapes. 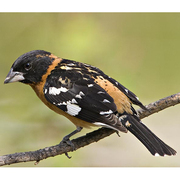 Black-headed Grosbeak has probably benefited in western counties from logging that has converted conifer forests to secondary hardwood forests. Most records from urban core probably represent migrants.